On September 15, 2008, the Wall Street giant Lehman Brothers filed for bankruptcy – the devastating end to a story 158 years in the making. Now, that story – the tale of how a trio of German Jewish immigrants and their descendants transformed a one-room fabric shop in Alabama into the fourth largest investment bank in United States, then brought it all crashing down – arrives at the National Theatre, presented in three chunks over a single evening. Stefano Massini’s 2015 Italian play has been adapted into English by NT deputy artistic director Ben Power, whose acclaimed condensation of DH Lawrence ran in the Dorfman in 2015. It’s directed by Olivier Award-winner Sam Mendes, and boasts a cast including Simon Russell Beale, Ben Miles and Adam Godley. But can that impressive ensemble enervate an Italian account of an American scandal? Has Mendes invested his time in The Lehman Trilogy wisely? Will the critics see a return on their three-hour sitting in the Lyttelton Theatre? So, what exactly is Massini’s play about? Is it all sub-prime mortgage bonds and credit default swaps? 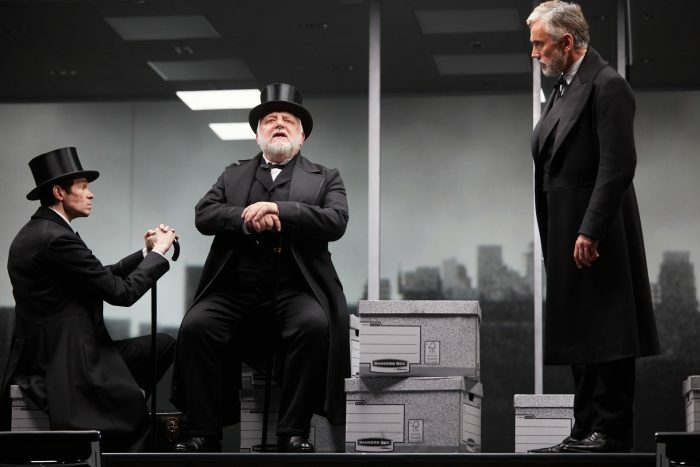 The Lehman Trilogy is far more than a bone-dry history of the credit crunch then – it’s a history of American capitalism, the critics agree, a slickly told narrative with just three multi-roling actors. “By setting the collapse of this bank in the context of one of America’s founding myths, it valuably invites you to ponder the question whether it was part and parcel of the dream that it would become tainted with hubris,” adds Paul Taylor (Independent, ★★★★). Directors don’t come much starrier than Sam Mendes. An award-strewn career in stage and screen was further bejewelled last year with an Olivier award for his incomparable production of Jez Butterworth’s The Ferryman at the Royal Court. How well does he chart the choppy waters of investment banking? He “surprises his audience and, in the process, surpasses himself” according to Matt Wolf (Arts Desk, ★★★★). Apparently, he “has never delivered up the kind of sustained, smart, ceaselessly inventive minimalism on view here” before. 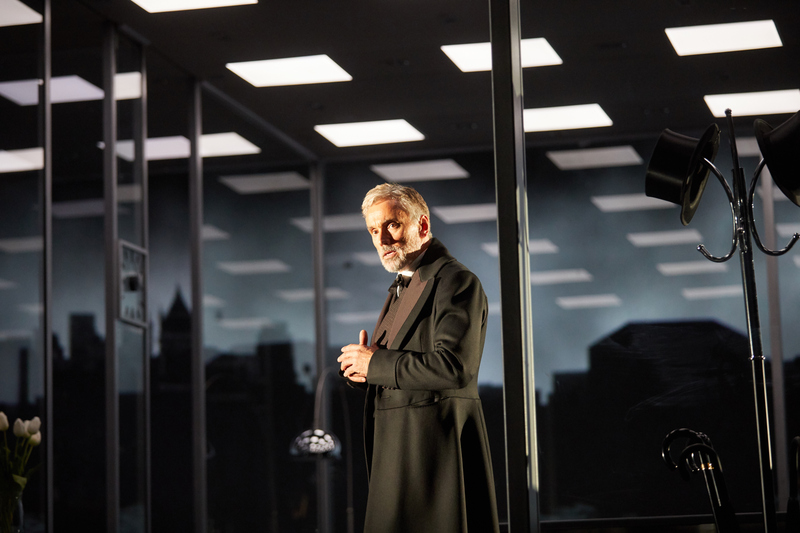 “Sam Mendes’s production has a fine sense of rhythm,” observes Hitchings, while Treneman lauds it as “a simple and elegant staging”, Taylor calls it a production of “extraordinary elegance and penetration”, and Ian Shuttleworth (Financial Times, ★★★) labels it a staging “of intelligence, sensitivity and beauty”. There’s plenty of praise for Devlin’s set, too. It’s “a thing of genius” according to Treneman and “beautiful to look at” according to Billington. Most, though, agree with Bano. As Billington asserts, “the joy of Mendes’s impeccable production lies in watching the actors”. 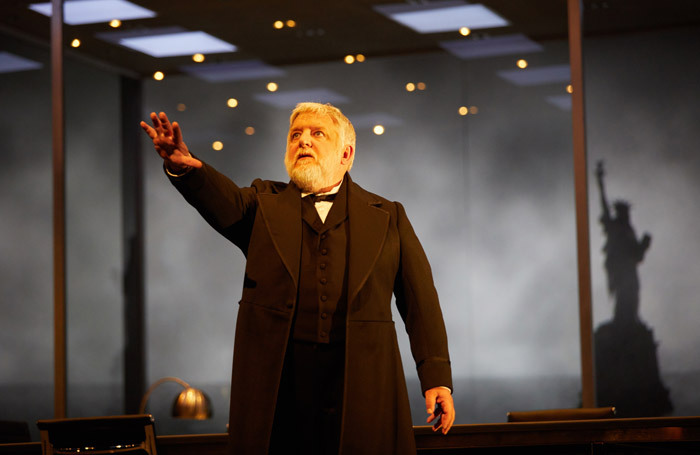 Indeed, what lecturers: two-time Olivier award-winner Russell Beale, arguably the greatest British actor alive; Ben Miles, star of Coupling and The Crown on screen and of the RSC’s Wolf Hall adaptation on stage; and three-time Olivier nominee Adam Godley. How does this intimidating trio of history teachers do? “At its heart, the performers feed off each other’s energy brilliantly, moving nimbly from one character to another in the space of a gesture, Beale variously gleeful and avuncular; Godley sweet and sinister; Miles invariably playing sturdier, more forceful personalities,” describes Demetrios Matheou (Hollywood Reporter). All three actors are showered with praise – they’re “absolutely first class” according to Wells and display “immense skill” according to Marianka Swain (Broadway World, ★★★★★) – but it’s Beale that gets most soaked. “Beale is particularly compelling in his portrait of the disturbingly single-minded (and latterly demon-haunted) Philip Lehman in the second generation (“Pure money! Pure adrenaline!”) but can metamorphose, with the tiniest shifts of gesture, into a demure 19th-century Alabama girl, a doddery rabbi, or a society spouse turned spiteful lush through neglect,” reports Taylor. 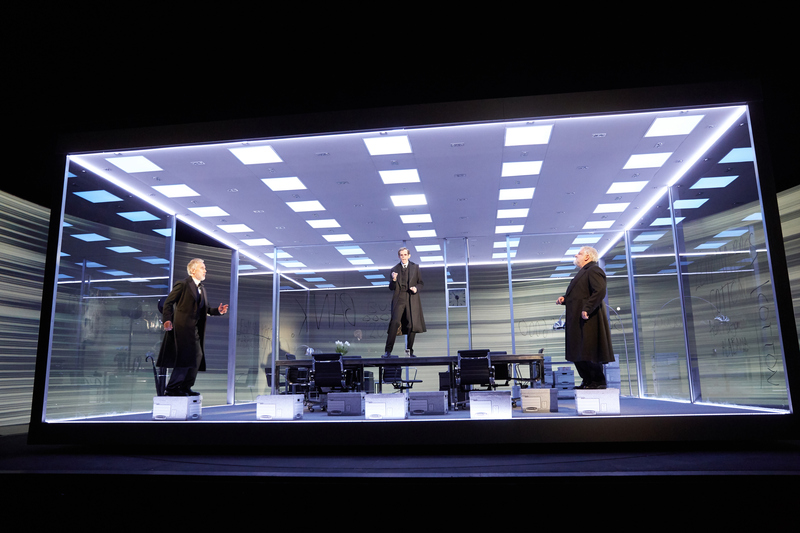 The Lehman Trilogy – Is it any good? Just a bit. 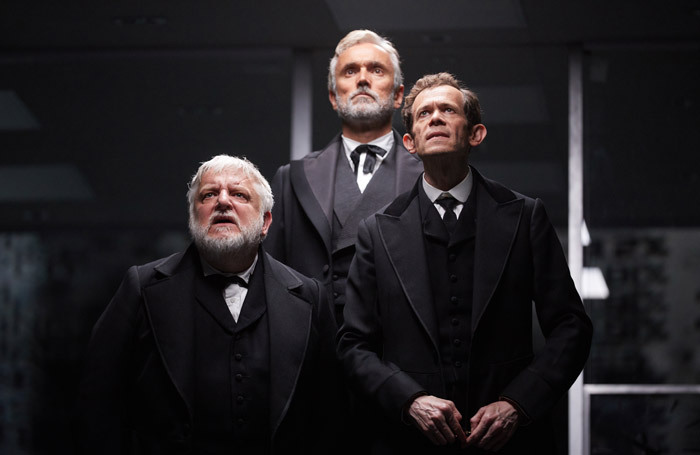 With four-star reviews aplenty, and notable five-star ratings from Michael Billington in the Guardian and Ann Treneman in the Times, it’s safe to chalk The Lehman Trilogy up in the National’s 2018 hit column. Massini’s play has been skilfully filleted and adapted by Power into a three-handed saga that squeezes the jolting journey of American capitalism into the story of a family business gone global, and Mendes’ stylish production is lit up by three extraordinary performances from Beale, Godley and Miles. But then, what were you expecting? Some stars are just bankable.